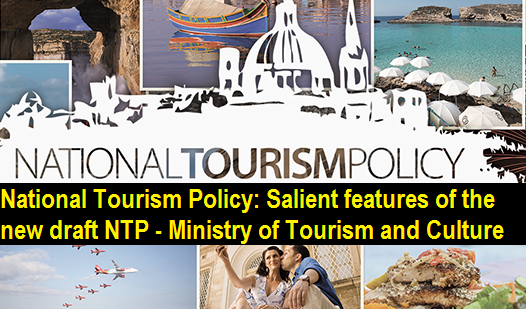 A National Tourism Policy (NTP) was formulated in 2002. However, taking into account the widespread, interrelated global developments and advancements, which have had a strong bearing on the Tourism sector, a new draft National Tourism Policy has been formulated and the same is yet to be approved. Focus of the Policy on employment generation and community participation in tourism development. Stress on development of tourism in a sustainable and responsible manner. An all-encompassing Policy involving linkages with various Ministries, Departments, States/Union Territories and Stakeholders. The Policy enshrines the vision of developing and positioning India as a “MUST EXPERIENCE” and “MUST RE-VISIT” Destination for global travellers, whilst encouraging Indians to explore their own country. Development and promotion of varied tourism products including the rich Culture and Heritage of the country, as well as niche products such as Medical &Wellness, Meetings, Incentives, Conferences and Exhibitions (MICE), Adventure, Wildlife, etc. • Development of core infrastructure (airways, railways, roadways, waterways, etc.) as well as Tourism Infrastructure. Developing quality human resources in the tourism and hospitality sectors across the spectrum of vocational to professional skills development and opportunity creation. • Creating an enabling environment for investment in tourism and tourism-related infrastructure. Emphasis on technology enabled development in tourism. Focus on domestic tourism as a major driver of tourism growth. Focus on promotions in established source markets and potential markets, which are contributing significantly to global tourist traffic, with targeted and country specific campaigns. Emphasis on Tourism as the fulcrum of multi-sectoral activities and dovetailing of activities of the Ministry with important/flagship schemes of the Government of India. National Tourism Policy: Salient features of the new draft National Tourism Policy, the widespread, interrelated global developments and advancements, which have had a strong bearing on the Tourism sector, a new draft National Tourism Policy has been formulated and the same is yet to be approved.